Just before I turned 18 I went to visit my aunt and uncle in Arizona, where I hiked in the White Mountains, saw the Grand Canyon and walked in the desert. Since then I've loved the southwestern clothing vibe, especially as its become so recently popular. 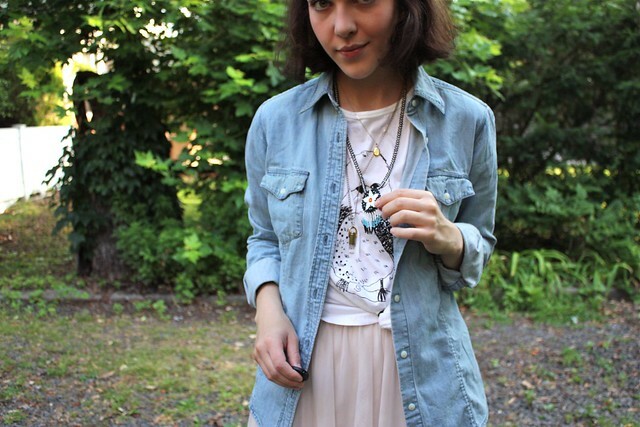 This isn't an outright copy of the style, but I added elements; a denim shirt, and an owl (My aunt and uncle had owls that would hang out in their hot tub all the time). Also a necklace I picked up in a souvenir shop at the Grand Canyon. I LOVE THIS OUTFIT, and the southwestern vibe. You are fabulous. Your outfit is so adorable! I've been meaning to ask for a while now, are those Kork Ease sandals as comfortable as the UO reviews make them out to be? this look is super cute. the skirt brings out the girlyness to the outfit. Such a pretty, flowy skirt! I love how you made it more casual with the t-shirt and denim top. Cute shoes too! P.S. That riot picture you have on your tumblr? My super-classy hometown! Mwhaha. i loooove the skirt, so soft and comfy!! I am in love with your t-shirt, it's perfect! I love owls, I have a painting of owls hanging in my room rescued from a thrift shop, they're such beautiful creatures. Like this outfit, it has a southwestern/romantic feel to it. YOu are so beautiful. I love this outfit on you so much. It is YOU. lovely and sweet, but comfortable. Very cool! 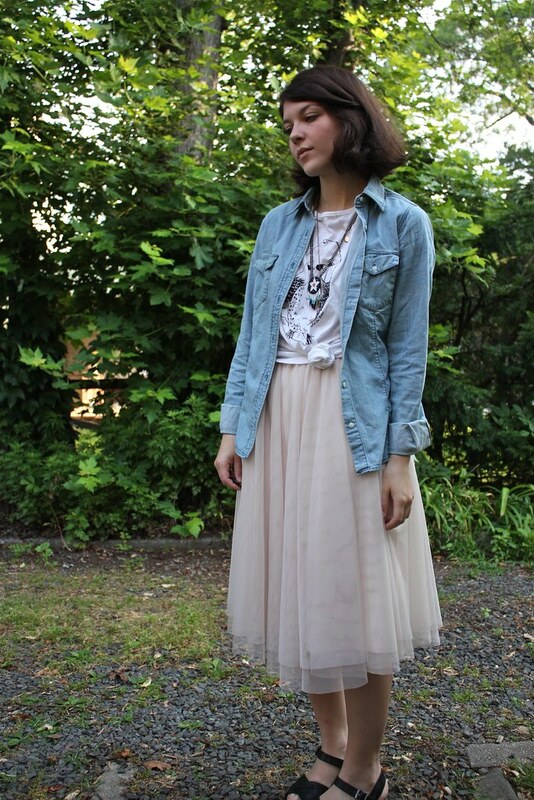 I really like the light, soft-looking denim shirt with the ballerina skirt. That story about the owls is so cute! I love this outfit! It is relaxed and still girly. So cute. 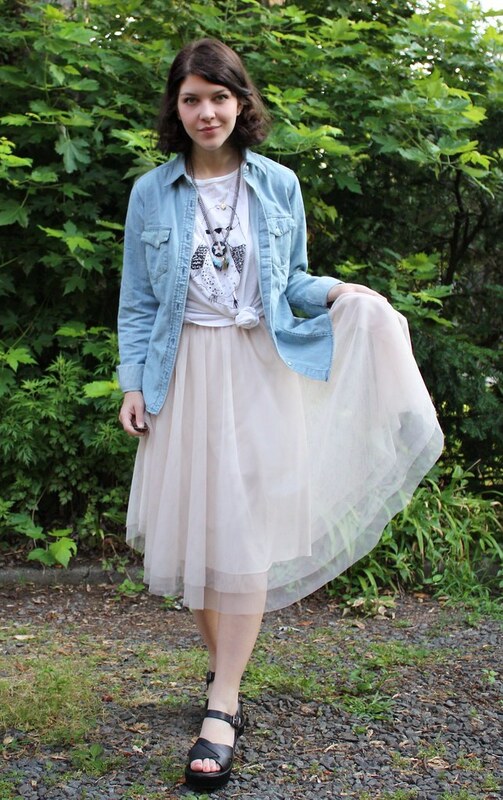 This skirt is the epitome of style and I love how you down played it's girlyness with a jean jacket! oh i love this outfit, the denum shirt is such a great contrast. i can't believe owls were chilling at the hot tub that must have been amazing.